The liquid-cooled, in-line Jumo engines that powered the last versions of the FW-190, epitomized the height of this famous fighter. Developed from the Fw-190D-9, the D-11 differed mainly in engine and armament. Whereas the D-9 was powered by the Jumo 213A, the D-11 used the more powerful Jumo 213F. This resulted in a barely perceptable change in the width of the nose section and a different radiator arrangement from the D-9. On the D-9, the radiator was flush with the front of the engine cowling, whereas the D-11 radiator was a toroid or like a doughnut with the elements along the outer edges of the cowling. The increased power also meant a larger, more oval supercharger intake and a larger paddle-bladed propeller. In addition, the D-11 had no cowl guns and instead had an extra set of 30mm cannon in the outer wing sections. The remarkable thing about the D-11 is that only 7 prototypes were built and a number of them were used in combat. Most of the references I found suggest that all D-11's were rebuilt from FW-190A-8 airframes. Only Nowarra's account differs in this respect. Actually, there is very little information available on the D-11, and that is printed below. V-56 werke # 170924; also used for engine tests and tests of MW 50 booster. Standard D-11 armament of 2 MG 151 20mm guns inboard and 2 MK 108 30mm cannon outboard. V-57 werke # 170926; Standard armament. V-58 werke # 170933. Same as with V-57. V-59 werke # 350156. Same as with V-57. Crashed October 9 1944. V-60 werke # 350157. Only D-11 built without armament. V-61 werke # 350158 (possibly 220004). Same as V-57. Used by Junkers as flying test bed. There is also some evidence of a D-11 werke # 220005 (or 220009). It is unknown which, if any, of the prototypes it might be. It was photographed with the double winkle (<<) of a senior officer; unit unknown at the time of this information being gathered. Of those listed, V-58 saw service with the JV-44 protection flight. It was coded red 4 and had the underside painted red with white stripes. In addition V-61 was flown coded <61; unit unknown. Eduard kit have certainly come a long way since they first started issuing kits. This is the weekend edition of one of their more recent boxings. It comes with one set of markings, no photo etch, no canopy masks and no resin parts as one frequently finds in their more expensive versions. It is also half the price of the 'standard' boxing, making it a real bargain for the money. This is not the only 1/48 Injection molded D-11 as ProModeler did this variant using the Dragon 1/48 D-9 as a basis and adding the appropriate sprues. It was blasted by the Luftnuts for some shape errors in the new bits. 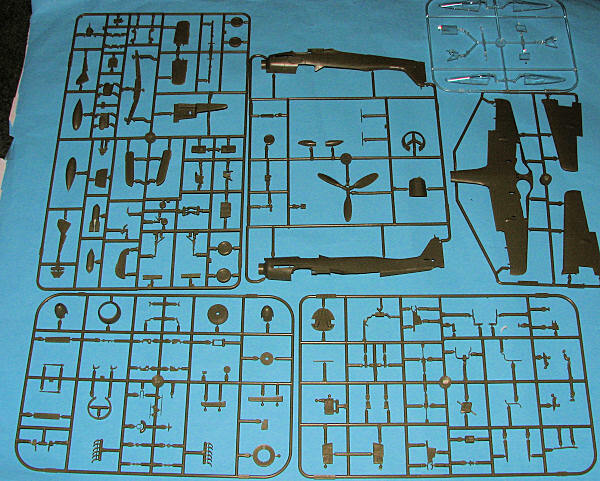 There are five main brownish sprues and one large clear one. The clear sprue is in its own bag, wing/fuselage sprues in their own bag, and the three others are packaged together. I found several small, fragile parts broken in this third bag thanks to the sprue parts getting tangled together during shipping. It would be nice if Eduard followed Hobby Boss' lead in wrapping these bits in foam sheet to keep them intact. Detailing on the parts is very good. I like that one is provided options in the cockpit as to using decals or painting the instrument faces. Eduard provides 'slick' instrument panels for the first option. This kit also provides the full engine accessory section that will be seen through the open wheel wells. This construct takes up over a half page of instructions. The kit provides separate ailerons and rudder. Flaps are molded up, but they are scored so that one could cut and lower them if wished. The upper wing section of the flap area has rib detail. One is provided with the option to have the cowl flaps open or closed. I notice that most modelers will chose open for this. The kit also has the option of having the wing gun panels and the nose gun panel open if one wishes. The gun bays do have nice detailing. I should also mention that one can pose the canopy open or closed. Instructions are very well drawn with detail alignment drawings provided for some aspects of the build. Gunze Mr Color paints are the lone brand that is shown for colors. I found it unusual at best that some bits were offered the optional color of either RLM 02 or Gunze's Super Chrome. 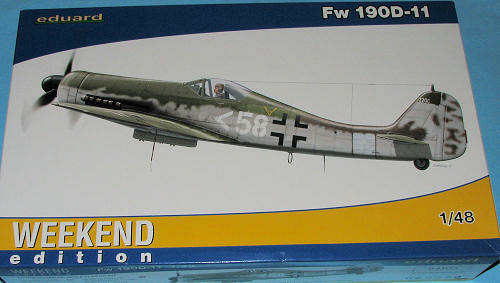 To my knowledge, no FW-190D had chrome parts. The lone option is for V58 in RLM 82/83 greens over RLM 76 with portions of the fuselage in RLM 81 brown-violet. There is mottling involved and portions of the lower wing are in RLM 83 and unpainted aluminum (so sayeth the painting instructions). Looking at other sections of the airframe, it seems to me that perhaps this plane used RLM 83 as a primer for things like wing tips, fin tips and aileron upper surfaces were so painted. Or it could be that these areas were prepainted and the unit was supposed to have them match the surrounding surfaces. Either way, it is an interesting take on this plane's camouflage prior to the application of the red underside. 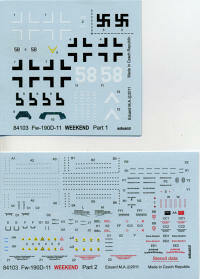 Decals are nicely done and one gets a full stencil suite on a separate sheet. Full placement diagrams are provided in the instructions. Overall, this is a fine kit that is certainly well worth the money, unlike several of Eduard's initial and 'special' releases which this reviewer finds to be over-priced.